Applesauce is a perfect complement to a pork dinner. I always have a pork tenderloin on hand in my fridge for a quick weeknight dinner. A pork tenderloin roasts in about 20 minutes and if you buy one of the marinated options there is absolutely no prep time required. That can be a real lifesaver when you are running behind and need to get dinner on the table. One of the things I do to make these pork tenderloin dinners my own is to serve them with my homemade applesauce. This post contains affiliate links for your convenience. When you shop through these links you help to support the costs to publish this blog. 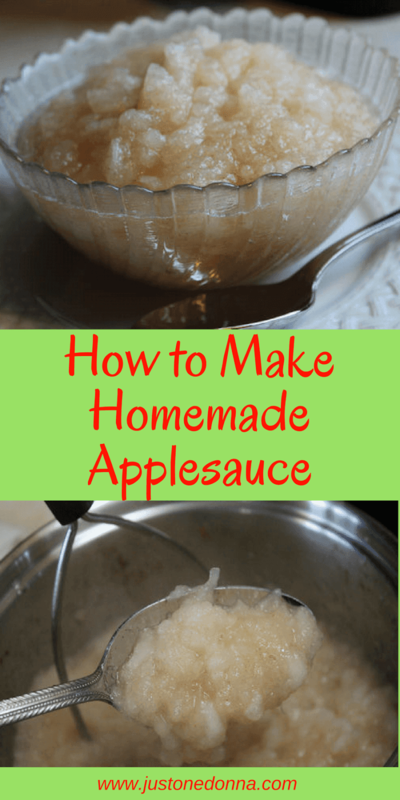 Homemade applesauce tastes so much better than any jarred sauce that I have purchased and takes so little time to make that I never buy applesauce anymore. September and October are the best times of year to make your own fresh applesauce as so many delicious apples come to market. You can have the applesauce cooking on the stove in about five minutes and it will be ready when the pork tenderloin is ready to serve. This is a five ingredient recipe. How easy is that? Just use my recipe as a starting point and adjust the salt, sugar, and cinnamon until the applesauce is perfect for your tastes. I like to use an apple variety that cooks down easily like McIntosh or Cortland, but you can use any variety you like. Choose any variety that looks and smells the most enticing. Mixing different kinds of apples is also yummy. You'll also want to use a good quality cinnamon because cinnamon and apples are the costars in this recipe. I like to peel the apples for my applesauce. I don't use a fancy apple peeler. I just use my favorite vegetable peeler from OXO. I actually like peeling apples and can usually peel an apple with one long ribbon of the peel. Don't be too fussy with the peeling. Leaving a few stray pieces of the peel in the applesauce will add to the color of the final product. The tools you'll use to make your applesauce are very low tech. All you need is a sharp vegetable peeler, a sharp paring knife, and an old-fashioned potato masher. You probably have these already in your kitchen. Taste your apples to assess how sweet they are. Decide how much sugar you think you need. I always start with less sugar because I like my applesauce to have a little tartness. Mix the apples, salt, sugar, nutmeg, and cinnamon together in a medium saucepan over medium heat. Add the water. Two tablespoons are usually enough. Cover the pot and let the mixture come to a boil. Turn the heat down to simmer. Cook the mixture for 10 to 15 minutes, until the apples start to collapse. Remove the pot from the heat. Using a potato masher, mash the apples until you get the consistency you want. I like to leave some chunks in my applesauce. Taste your applesauce and add more sugar or cinnamon as needed. Serve your homemade applesauce warm or chilled. Make extra applesauce and mix it with your favorite plain yogurt or serve it on top of your morning oatmeal. It's also delicious served warm with vanilla ice cream. Yum! Thank you for your support by sharing this recipe with your friends on social media. Your Facebook, Twitter, Pinterest, and Yummly shares are very much appreciated.